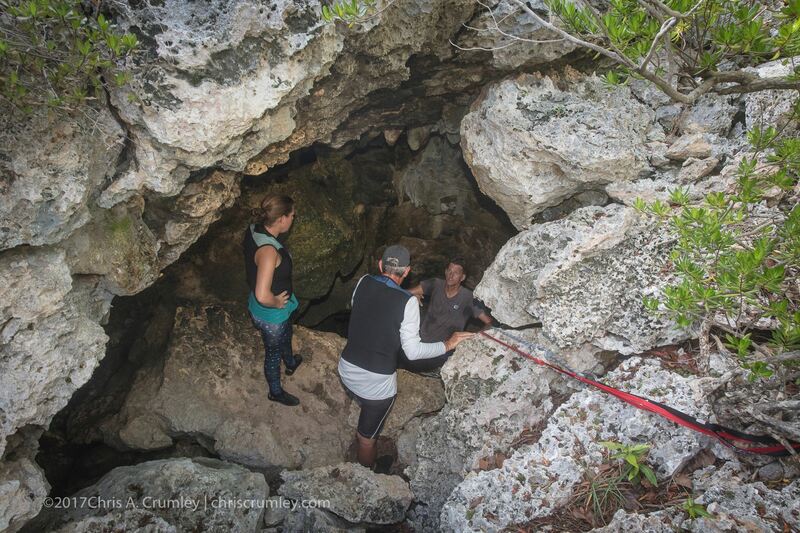 Today, a six-minute drive north of Buddy Dive Resort we're a 5-minute bush trek to the entrance to the Water Cave, Cave#2. We're going first into the cavern area (this photo), then into the cave sections (pure black without lights). Our guide is indispensable to get down 55' underground (18m) to Cave#2 (the wet cave). Derek knows the route and brings the necessary lights, climbing ladder and rope. Here, Malena Sharkey, Robert Minnick and our guide Derek start downward. We lit the cave for photography with a pair of Keldan 8M video lights from Reef Photo Video. -- with Malena Sharkey and Robert Minnick.